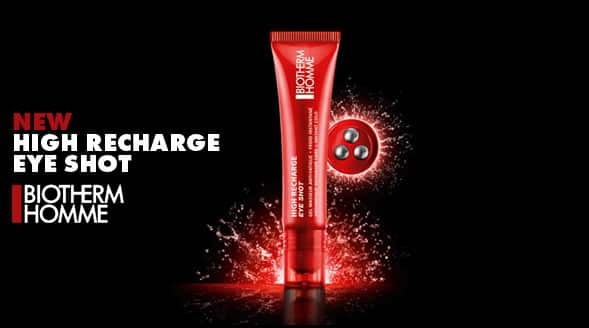 Biotherm Homme High Recharge Eye Shot is a powerful new member of the Biotherm Recharge family. More than a standard eye gel, and far, far more than a standard ‘rollerball’, this product is made of a lightweight absorbent gel dispensed through a whopping 3 rollerballs. It’s ridiculously cooling, fast-acting and absorbing, and over the past week has become the first thing I reach for at the end of a long day. My entire eye area feels immediately relaxed. My eyes really do look instantly brighter after using this product and it’s definitely helped with my dark circles (an unfortunate consequence of juggling a full time degree course, working for Clinique and, when I’m not studying, slaving away over a hot computer reviewing, writing and researching when I should probably be sleeping). The magical ingredient is caffeine, the eye serum’s favourite, it’s a natural anti-inflammatory and smooths skin. Sericoside is a natural extract that increases circulation around the eye area and finally manganese helps protect the skin and is a valuable anti-oxidant. It feels amazing and is definitely worth a try. I’d definitely suggest popping it into the fridge for storage to give the product’s already icy coolness a big kick. High Recharge Eye Shot is just £18/15ml at Boots, so you can get collecting your points! This article first appeared on MANFACE written by Thom Watson. It was published on Tuesday 21st February 2012 and was last updated on Monday 3rd April 2017 at 4:27pm. It's categorised under Biotherm, Dark Circles, Eye Care where you'll find more related content. I’d have to say Clinique Anti-Fatigue Cooling Eye Gel. It just seemed to make a bigger difference to my eye area. What do you think that is better clinique anti-fatigue cooling eye gel or biotherm homme high recharge eye shot?